Tunku Ismail Idris Abdul Majid Abu Bakar Iskandar ibni Sultan Ibrahim Ismail (Jawi: تونكو إسماعيل إدريس عبدالمجيد أبو بكر إسكندر ابن سلطان إبراهيم إسماعيل; born 30 June 1984) is the Tunku Mahkota or Crown Prince of Johor, heir apparent and first in line of succession to the throne of Johor. He is the eldest son of the current Sultan of Johor, Sultan Ibrahim Ismail and his consort Permaisuri Raja Zarith Sofiah. He is the grandson of both Sultan Iskandar of Johor and Sultan Idris Shah II of Perak. He is also a half third cousin of Nazrin Shah of Perak (the current Sultan of Perak) since both share a common male ancestor (Idris Shah I of Perak). He is also a grandnephew as well as nephew by marriage of Abdullah of Pahang, the Sultan of Pahang and an 11th cousin of Tengku Muhammad Ismail, the crown prince of Terengganu since they both share a common male ancestor (Tun Habib Abdul Majid). Tunku Ismail completed his early education at Sekolah Sri Utama and Sekolah Rendah Kebangsaan St. Joseph in Johor Bahru. He subsequently received lower secondary education at the Australian International School in Singapore and continued with his higher secondary studies at Hale School in Perth, Western Australia, until 2002. Tunku Ismail is the eldest among six siblings. Like his father, Tunku Ismail has no tertiary (academic) qualification. Tunku Ismail was appointed Raja Muda (literally means "Younger King," but taken to mean as second Heir Apparent or son of the Crown Prince) on 8 April 2006 by his grandfather, the late Sultan of Johor, and placing him second in line to the throne (Now first in line after the passing of Sultan Iskandar). Tunku Ismail was appointed as the Tunku Mahkota of Johor on 28 January 2010. Following a family tradition of getting trained in armed forces, with his late grandfather in the Malaysian Army and father in the US Army, Tunku Ismail aspired for a career in the Indian armed forces. In July 2003, he enrolled as a cadet officer in the Indian Military Academy, India’s premier military training school located at Dehradun. He was commissioned as a lieutenant in December 2004 and absorbed into the Indian army. He was promoted to the rank of captain in December 2007. He is the first ever Malaysian royal to join the Indian armed forces. The Malaysian prince is the first foreigner to lead a unit of Indian Army in the Indian Republic Day Parade. On 26 January 2007, with a rank of captain in Indian Army, he led a mounted column of Jaipur-based 61 Cavalry regiment to salute president of India Dr. A.P.J. Abdul Kalam during the Republic Day celebrations. The president himself chose Tunku Ismail to lead the unit of around 400 men of the world's only non-ceremonial horse-mounted cavalry. The parade was witnessed by chief guest of the day president of Russia Vladimir Putin and his entourage, along with other dignitaries of Indian politics and military amidst tight security. Tunku Ismail's father Tunku Ibrahim Ismail flew in from Johor Bahru on 23 January 2007 to be present at the celebrations while his son added a chapter to the history of Indian Army. A polo enthusiast, Tunku Ismail is a skilful horse rider. He was bestowed the Best in Riding award among IMA cadets between 2003 and 2004. He is also a polo player for his regiment and has won many trophies. In football, he is the president of Johor FC. The prince is also a sports car enthusiast. All of his cars are registered under the same licence plate of "TMJ", an abbreviation from the title Tunku Mahkota Johor which is also his nickname as addressed informally by Malaysians within and outside Johor. He is noted for his religious moderation and veiled criticism of more conservative Muslims who denounced him for shaking hands with women in 2016. His Highness the Tunku Mahkota (Crown Prince) of Johor, Tunku Ismail Idris ibni Sultan Ibrahim has been appointed as the President of Johor Football Association (PBNJ). The EGM held in Johor Bahru saw the Crown Prince appointed as the new President replacing the former, Jais Sarday. Among his plans to help bring back Johorean football to its former glory, the Crown Prince merged the Johor teams (which previously were Johor FC, MBJB and MP Muar) into only one where all of the players wear the Jengking (Scorpion) Team Jersey. .
Tunku Ismail's leadership on the club Johor Darul Ta'zim F.C also oversaw its success as the first Southeast Asian club to lift the AFC Cup in 2015. In 2014, the Football Association of Malaysia (FAM) appointed the Tunku Ismail Sultan Ibrahim as an advisor to the previous FAM president, his uncle, Sultan Abdullah of Pahang. Tunku Ismail assisted and worked hand in and with FAM in improving the quality of football within the country, particularly with the national team as well as the junior teams. As predicted, there were several concerns about the news, particularly with Tunku Ismail having lost the FAM presidency election to Tengku Abdullah earlier that year. Besides that, he had been extremely vocal with his criticisms on the nation's footballing body. However, the then Johor FA president was extremely optimistic about the new role, claiming that he will only be pushing for the betterment of football within the country. He was elected as President of FAM for a short term from 2017-2018. Second Class – Darjah Kerabat Yang Amat Dihormati Pangkat Kedua (DK II) on 8 April 2006. First Class – Darjah Kerabat Yang Amat Dihormati Pangkat Pertama (DK I) on 11 April 2009. Companion – Darjah Mahkota Johor Yang Amat Mulia Pangkat Ketiga Setia Mahkota Johor (SMJ) on 8 April 2004. 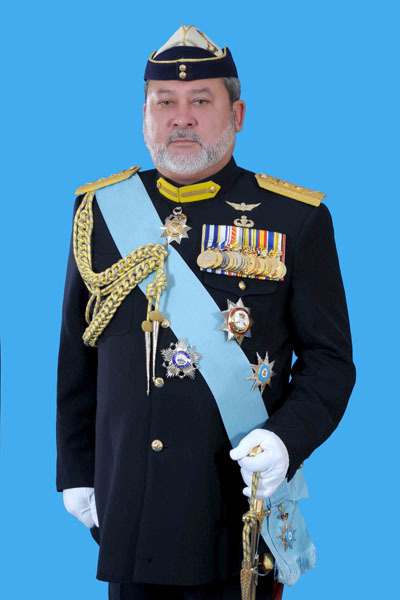 Knight Grand Commander – Pangkat Pertama Darjah Mahkota Johor Yang Amat Mulia, Seri Paduka Mahkota Johor (SPMJ) on 8 April 2005. Sultan Ibrahim Coronation Medal (PSI, 1st class) on 23 March 2015. On 24 October 2008, reports surfaced about a confrontation and a royal scuffle which allegedly occurred in a nightclub at Crowne Plaza Hotel in Kuala Lumpur between two princes. Tunku Nadzimuddin, a member of the Negeri Sembilan household, filed a police report accusing of a Johor royal whom he identified the culprit to be Tunku Ismail; for initiating the confrontation and assaulting him in the face and head. A friend of Tunku Nadzimuddin, Shamshudhuha Ishak, a lawyer, filed another police report accusing of Tunku Ismail's bodyguards of assaulting him and losing two teeth in the process. The following September, Tunku Nadzimuddin lodged a complaint against the police and the Attorney-General chambers for not responding to the police report that he had made earlier for a RM50 million monetary settlement over the alleged episode. In a press interview, Tunku Nadzimuddin claimed that he was roughed up by Tunku Ismail and his bodyguards after the a friend of Tunku Ismail called Tunku Nadzimuddin that he had wanted to apologise over a bottle-throwing incident, while Tunku Nadzimuddin was partying. Tunku Nadzimuddin looked for Tunku Ismail with Shamshudhuha, but they quickly assaulted by Tunku Ismail's bodyguards. Shamshudhuha was beaten unconscious, while Tunku Nadzimuddin was threatened by Tunku Ismail with a pistol pointing to his head, and led to a hotel room where they were confined. The police later arrived after Tunku Nadzimuddin called for his mother. The Johor royalty denied Tunku Nadzimuddin's claims, and stated that Tunku Ismail was barred from meeting Tunku Nadzimuddin that night for security reasons. On 24 October 2014, Tunku Ismail married 21-year-old Che' Puan Khaleeda Bustamam at Istana Bukit Serene in a private ceremony. The solemnisation ceremony was performed by Johor mufti Datuk Mohd Tahrir Samsudin. The royal wedding took place at Dataran Bandaraya (or 'City Square') in November 2014. Khaleeda, daughter of Bustaman Daud and Aziyah Abdul Aziz, is the youngest of five siblings and was born in Kuala Lumpur. The couple's first child, a daughter named Yang Amat Mulia Tunku Khalsom Aminah Sofiah, was born on 25 June 2016. Their child second, a son named Yang Amat Mulia Tunku Iskandar Abdul Jalil Abu Bakar Ibrahim, was born 14 October 2017. ^ a b c d e f g Johor Ruler's Grandson Appointed Raja Muda. bernama.com. 8 April 2006. ^ a b c Tunku Mahkota's son named Raja Muda of Johor Archived 10 April 2006 at the Wayback Machine, The star online, Star Publications, 9 April 2006. ^ Tunku Ismail proclaimed Tunku Mahkota of Johor Archived 4 June 2011 at the Wayback Machine, Star Publications, 28 January 2010. ^ a b Malaysian Prince to Lead Indian Army Unit in Republic Day parade, India Defence, 23 January 2007. ^ a b c Malaysia's Pride On Show At India's Republic Day Parade, BERNAMA, 26 January 2007. ^ a b M'sian Prince To Lead Cavalry Unit At India's Republic Day, BERNAMA, 24 January 2007. ^ Shadiqe, Jasmine (31 December 2012). "Glory cannot be achieved overnight". New Straits Times. Retrieved 1 January 2013. ^ "Malaysian democrats pin their hopes on the country's royals". The Economist. 28 January 2017. Retrieved 29 January 2017. ^ "JOHOR DARUL TA'ZIM CROWNED AFC CUP CHAMPIONS". the-AFC.com. Asian Football Confederation. 31 October 2015. Retrieved 9 September 2016. ^ Sundaresan, Keeshaanan (4 October 2014). "TMJ appointed as FAM advisor". FourthOfficial.com. Retrieved 3 October 2014. ^ Farhaan Shah, Mohd (9 November 2014). "Big crowd at Johor royal wedding". AsiaOne. The Star/Asia News Network. Archived from the original on 11 November 2014. Retrieved 10 November 2014. This page was last edited on 11 April 2019, at 06:54 (UTC).